Multipurpose machine: cleaning with detergent, steam, steam with detergent, foam and hot water. Equipped with a compres-sed air connection and pressure gauges for air and steam. 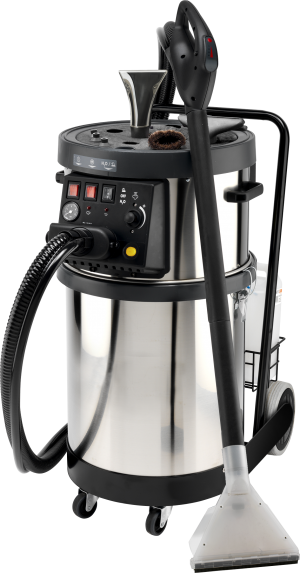 Unlimited autonomy of steam thanks to the electronically con-trolled power supply of the boiler, which enables water top-ups in the tank without having to stop the machine or interrupt work. Hot air output blow function for quick drying of car interiors with a 2 m ﬂexible hose. Discharge pipe to quickly drain dirty water from the tank. Two-stage bypass vacuum motor. Equip-ped with 3 pumps: boiler, detergent and water. Maximum safety thanks to the 2 safety thermostats, 1 pressure switch and 1 mechanical maximum pressure valve. Pressure / temperature max 10 bar/180 °C bar/�C 7 bar/165 °C bar/�C 7/158 bar/�C 9 bar / 175° C bar/�C 9 bar/175 °C bar/�C Absorbed power 10 Kw/400 W-50 Hz 3Ph kW/V-Hz Ph 18 Kw/400 W-50 Hz 3Ph kW/V-Hz Ph 3 Kw/230 V-50 Hz 1Ph kW/V-Hz Ph 3,3 Kw/230 W-50 Hz 1Ph kW/V-Hz Ph 3,3Kw / 230V - 50HJz (Ph 1) kW/V-Hz Ph 3/230 kW/V-Hz Ph 30 Kw/400 W-50 Hz 3Ph kW/V-Hz Ph Type / volume boiler Inox AISI 304 / 4 l. inox AISI 304/18 l. inox Aisi 304/4 l.